The Definition 3 is the third installment to the series. The purpose of this mix is simple: all TRUE Hip-Hop mixed back to back as an original mixtape should be. It features new school, old school, remixes, and some in between the times. The intention to the "Definition" mixtape series is focus on the origin of "the mixtape" in Hip-Hop Culture. 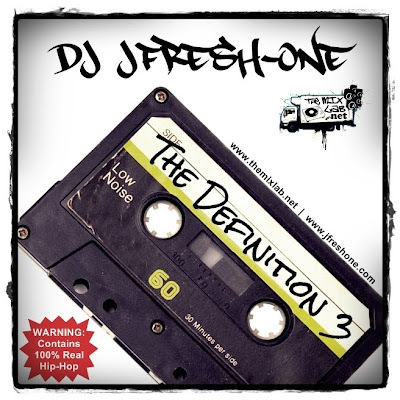 DJ JFresh-One showcases a non-stop mix for y'all to enjoy on your box, iPod, car, work, wherever! Just enjoy the selections and support the REAL mixtape tradition....ENOUGH with the "street albums", "demos", "promo CD", etc!!! 19. Redman & Method Man - Y.O.U.